Technology has advanced in many ways, and the dental profession has taken advantage of these advances to offer new ways of dealing with common dental problems. Dental implants are just one of these advances, and have made the health and lives of many patients simpler and more fulfilling. The more you know about dental implants, the better prepared you will be when the time comes to have to make a decision. The basic use of a dental implant is to replace broken or missing teeth. A standard procedure before implants became available was a partial or full denture plate. Teeth would be attached to an acrylic material that would be held in place by the soft tissue of the gums. Denture adhesives would be used to assist in keeping the denture in place. An implant is a permanent solution for replacing one or a number of teeth. Instead of attaching teeth to an artificial structure like a denture, each tooth has its own support structure in the form of a pin that is placed inside a hole drilled into the jawbone. A crown is then placed on top of the pin, creating what is in effect an artificial tooth. These structures are permanent and can last a lifetime. A single tooth can take between 30 minutes and 3 hours to complete in the dentist’s office. After the procedure is finished, for the teeth to completely set and the gums to fully heal can take as long as 6 months. Despite what seems to be a long time for the treatment to finally be completed, the permanent nature of the dental implant is worth the wait. This procedure is becoming more common as an alternative to dentures. For people with missing or broken teeth, it is a simpler and more natural looking choice. It is a low maintenance solution once the procedure is completed. Most people will be able to take advantage of the dental implant procedure, though there may be some that for general health reasons would be denied. One of the biggest reasons for the growing popularity of implants is they look and feel like natural teeth. They can be cleaned and maintained like your natural teeth. Because the material used is identical to a crown, you can chew and eat normally. There are significant advantages to implants that many people are discovering. People who currently wear a partial or full denture will appreciate the many advantages of a dental implant. The possibility of dental health problems such as sore gums and infection are virtually eliminated. Dentures can crack or be broken, requiring a new set to be created – and having to adjust once again to a new set of teeth. And denture wearers know too well the cleaning required on a regular basis. One of the most important points to remember about a dental implant is that it is designed to be a permanent structure. The greater the number of implant procedures you have, the more important it is to be sure each one is properly positioned. 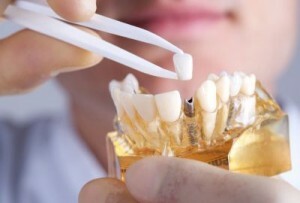 This is why from the beginning you need to have a highly qualified and professional dentist who has a proven track record of successfully implanting teeth. There are a number of issues for the dental surgeon to consider, including making sure there is enough bone available to drill the holes for the implants, determining where each of the nerves are, and making sure the holes that are drilled are not too deep and in the right location. A mistake in any one of these areas can cause the surgery to fail. Because the goal of the surgery is to create a permanent solution, repairing any mistakes, if possible, will be much more complicated.